Discussion in 'General Discussion archive 2017 (read-only)' started by Famous when dead, Sep 11, 2017. You can buy it on iTunes as well. I'm pleased to say that both the official .wav & .wma are now available to download via the download/bootleg forum. sounds great.this is a song that actually sounds better live. brilliant lyric ! brilliant vocal delivery ! and the band ain't too bad either ! The lack of enthusiasm over these Live tracks truly puzzles me. Only a handful of posts in 12 hours? 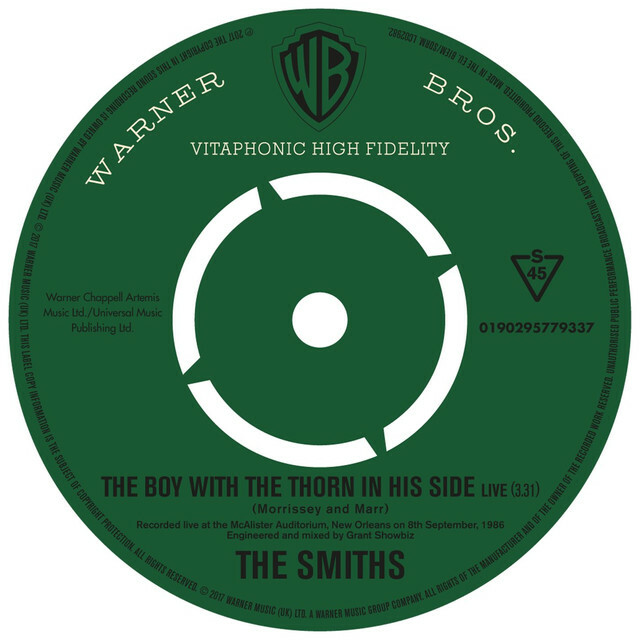 The idea Moz doing that song live again and change the lyrics into "the boy with the axe in his hand" makes me laugh. Technically it could be done very easily as the number of words and the rhythm would be the same. Remember to celebrate No Thanks Giving with "The Soy with some Corn on the side"! Get some Tofurkey and delicious corn! Also feel free to slap the mess outta any of your family members who murder a Turkey! sorry for being of topic and as a lot not making this thread/item a more songlike comment.
" but also got on dangerous way,chasing the dragon, it's over this centurie...but I don't think I would've got through without the Smiths and Morrissey"
I like this a lot, celibate! It's such a very powerful message and a hopeful one. Isn't "prove" of the magic of music? It may sound too beautiful and cheesy but I do believe it can be like that. I hope you are fine and a feel okay in your new house! it's cheesy from my side but really the lyrics gave me something who knew me, not that the Smiths played or Morrissey sang about drug addiction,that was my wrong escape of my inner feelings and thoughts, but lot of those thoughts and feelings were in the lyrics. Thanks sir Quando for the support but the old town where I grew up changed a lot, but it's OK,have some time that I feel relaxed here, I must go out for a walk,but I've still got a social psych. org. who guide me, and another org. who tries to use my wings and go to places to meet other people, in a safe place. This is the house/appartment I gonna live till I die, I know I don;t get old, but I messed with dangerous poison and didn't look after myself,or think about physical damage...plus I had some personal issues not drug related accidents which won't do my lungs and heart good,but I'm glad,and never could think that I ever would have a life like now and when I lived the last 15 years in Eindhoven, but I'm home, in Best. Vicar In A Tutu is now available on Spotify. It's been noted that couple of the tracks released so far are light on bass, but this one seems to have no bass or second guitar at all, or they're mixed down so low it's impossible to be sure they're actually there. It makes it more interesting, suppose, but the choices for some of these tracks are maybe a bit puzzling. Its very nice you do this. Very Helpful. . Thanks.